With a history of releasing new and creative games for online casino bonus hunters, Yggdrasil Gaming moves forward with the release of their first progressive jackpot video slot. 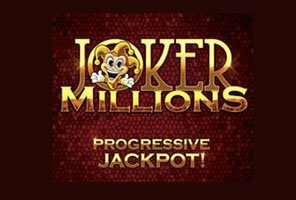 With a release date approaching near the end of February 2015, Yggdrasil casinos will be set to offer players the chance to win even bigger with every spin thanks to their new progressive slot machine, Joker Millions. Keeping true to the name of the game, this new five reel will be among the biggest prize pools of it's type with an expected roll out of approximately $1.3 million as a starting point. While most progressive jackpots are triggered either at random or by hitting an incredibly elusive string of combinations on the screen, Yggdrasil's upcoming release has a new concept that is sure to build excitement as players can see their symbol collection growing towards the winning combination. In the case of Joker Millions, Sticky Wilds keep their spot on the reels and collect until every symbol space is occupied by them and the progressive jackpot win is set off and a lucky play ends up with a huge win. The amount of money offered by these types of prize pools can truly change the life of the winner with only a few spins of the reels. Fredrik Elmqvist, Yggdrasil Gaming's CEO, spoke about the upcoming launch of Joker Millions, saying that the slot was created with the enjoyment of players top of mind and that users would have fun playing thanks to Mystery Joker wins, even if there weren't a chance at a huge payout from the progressive prize pool on the table. Along with this exciting news comes information on how the game will be unveiled. The ICE Totally Gaming Conference will see Joker Millions presented across a wall of monitors at the Yggdrasil booth ad several of their partnered sites have agreed to put their funds together to sponsor the initial jackpot to get the game moving the right way. Yggdrasil has been a powerhouse throughout 2014 in recreating their entire brand through improving their already great game selection, forging new partnerships with online casinos from all over the world, and diving into new game styles. Not only has their release schedule improved but the availability of their product got better through agreements with more than a dozen new casino operators in just the first few months of last year. They have also moved into the realm of 3D video slot machines in the closing months of 2014, and are now starting out this new year the right way with a progressive slot. Try out Yggdrasil Gaming's fantastic new game, Joker Millions, at 7Red Casino where all new players are treated to a $7 No Deposit Casino Bonus to get rolling towards an amazing jackpot in style.